This application is perfect for users that are starting to study web programming or that are interested in that field. 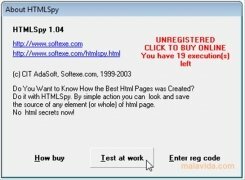 Thanks to HTMLSpy you will be able to copy the fragments of code that interest you most of any website and check them later to be able to see how other programmers do their work. A good method to learn procedures and tricks that will surely come in very handy to those that are interested in this theme. That application works as a spy, copying and storing the fragments of code that are of your interest. You will only have to check the stored files to be able to start seeing how other programmers develop the code, thus becoming a fundamental tool if you are starting to program in HTML. 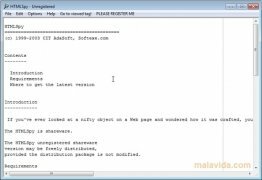 It will be possible to view the code that you are interested in with color coded semantics, to preview the code in the browser, carry out cut and copy tasks or access a history file with the URLs that the code has been taken from. 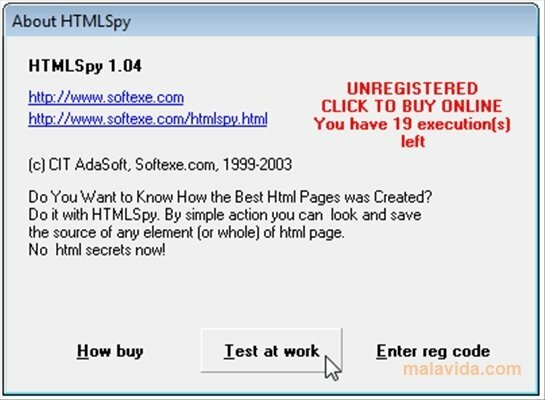 HTML code will no longer have any secrets for your thanks to HTMLSpy. The trial version can only be launched 20 times.